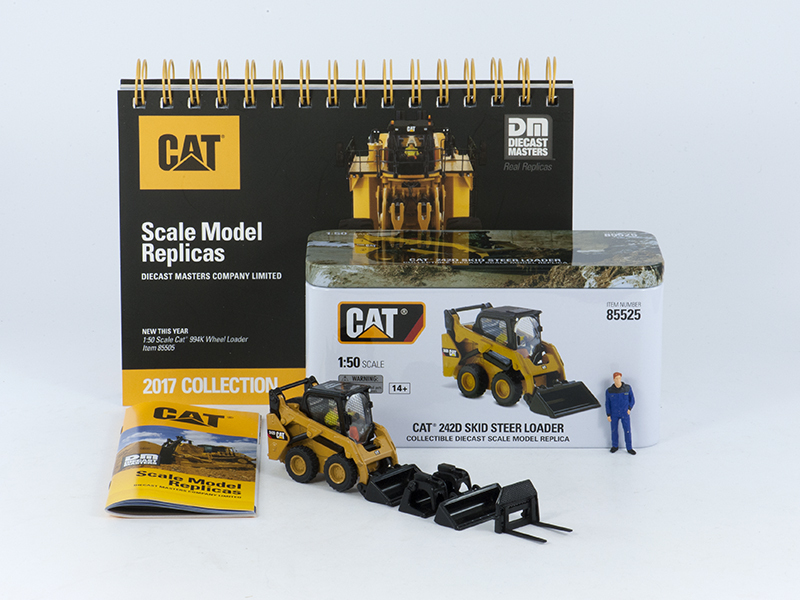 MINIMOVERS scalemodels - Caterpillar 242D Skid Steer "TOY FAIR 2017"
Caterpillar 242D Skid Steer "TOY FAIR 2017"
The Caterpillar 242D in 1:50th scale was in 2017 released with #85525 by Diecast Masters. As a gift from Diecast Masters (Thanks Klaas) and IMC Models (Dito Joris) I now can add this special Edition of the Caterpillar 242D Skid Steer Loader in scale 1:50th in my collection. The Caterpillar 242D Skid Steer Loader "TOYFAIR 2017 EDITION" is released in a limitid Edition and was given to Customers and Relations during the Spielwaren Messe aka TOYFAIR 2017 in February this year. I'm therefore very pleased I also was given this special scale model. My first impression: Welcome addition to my Skid Steer & Compact Loaders collection. In my opinion an excellent die-cast scale model made by Diecast Masters! Truly a super surprise! I am therefore extra pleased that Diecast Masters has been given the opportunity and took the challenge to deliver both the Caterpillar 242D Skid Steer Loader and the Caterpillar 259D Compact Track Loader in 1:50th scale. While normally one would expect the more common 1:25th or 1:32th scale for this type of Equipment: WORLD CLASS! !